PK Sound developed a speaker system called Trinity, which uses software and robotics to funnel sound precisely where it needs to go. The summer festival season is deep under way. And make no mistake, it will get loud. There are a myriad of concerns facing music event organizers, from assembling a compelling schedule of talent, to ensuring the proper beer-vendor-to-portable-toilet ratio, and, finally, to supplying enough pimento loaf to satisfy Broken Social Scene’s backstage deli-tray needs. Near the top of any to-do list is the complicated matter of amplified sound. Getting the music toward the ears of the people who want to hear it is not a problem – that issue was solved at Yasgur’s Farm in 1969. Rather, the challenge is to make sure the noise isn’t drifting to residents living near festival sites. If you think Arcade Fire is thunderous, nobody makes a racket like a music-averse NIMBY. Working to solve sound-bleed issues is Jeremy Bridge and his Calgary-based company PK Sound. Bridge and his team have developed a speaker system called Trinity, which uses software and robotics to funnel the sound precisely where it needs to go. Factors affecting sound travel include wind, rain, temperature, even the cloud ceiling. All those conditions can be dealt with swiftly with a touch of a laptop key. Slats within the Trinity speakers are shifted to control sound direction. Shambhala, an annual electronic music bash, is set on a cattle ranch in the West Kootenay mountains. Sound wafting to surrounding areas isn’t a major concern there. But in urban places, with ever increasing population density, stemming the bleed is a high priority. 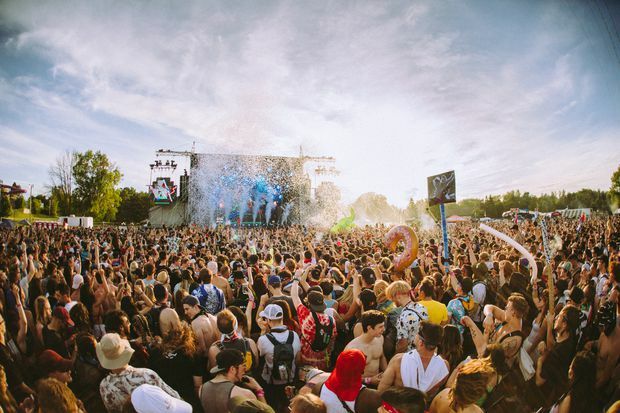 In 2017, drifting decibels at the Ever After Music Festival in Kitchener, Ont., resulted in some 130 noise complaints. This summer, organizers of the annual electronic dance music (EDM) event brought in Bridge and his PK Sound techs as consultants. The result? Just six nearby residents complained that their peace had been disturbed. Asked about the advanced PK Sound technology and know-how, Mattacchione puts it simply: “We like it, the talent likes it, the city officials like it and the residents like it. Trinity will be the system we’ll use." EDM festivals are particularly prone to noise complaints. Thanks to its deep, resonant frequencies and because of its reputation for youthful (let’s say) exuberance, the genre and its thumping, rowdy gatherings are less than palatable to older demographics. Because of that, Bridge and PK Sound have carved out a specialty, working on such EDM events as Ottawa’s Escapade Music Festival and the gigantic Electric Daisy Carnivals in Las Vegas and Mexico City. And while the technology is especially valuable for use at outdoor venues, PK Sound systems see duty on arena tours as well. One satisfied client is country star Dierks Bentley. As for the future, Bridge sees growth in Asian and European markets. “These are exciting times for sure,” he says. People are talking. Sound carries.